Who's Got Cold Feet? ~ Not Me! The "cold feet" to which I am referring in the title of this post implies being cautious or afraid to do something. But this post is going to be about the physical condition of having feet that are actually cold because of low temperatures. If I have cold feet today, I can put on an extra pair of regular socks (or maybe a first pair), or I can put on thermal socks that have a source of power to heat up. I can also simply turn the heat up in my house or car ~ because if my feet are cold, the rest of my body might also already be, or soon will be getting, cold. The item shown at the top of this post is what was known, variously, as a foot-warmer or foot-stove. In fact, before the cast-iron house stove was invented, the foot-warmer, in its Dutch form, was called a stoof, from which the English word stove was derived. As the other photos show, the foot-warmer was constructed of a tin box held in a wooden frame. The sides of the tin box were pierced with holes in a design ~ in this example, of a heart within a circle. The holes were not just for design purposes, but rather they provided multiple points to permit heat to radiate outward from the center of the box. The box had one little door which gave access to the center of the box, and through which a small scoop or tray could be inserted (to add hot coals) or removed (to discard the spent ashes). A wire handle on the top of the foot-warmer made it easy to carry. The user would scoop up some hot coals from the fireplace or pull them out of the stove, using fireplace tongs or shovel. The hot coals would then be placed in the scoop/tray, and then into the foot-warmer. The foot-warmer's door would be closed and fastened (in this example by a small loop of wire that was bent to catch on the inside edge of the box). The user would then lift the box by the wire handle and carry it to the carriage. The foot-warmer would normally be set on the floor of the carriage in front of the seat, the riders would take their places on the seat with their legs and feet on either side of the foot-warmer, and then they would spread a blanket over their laps. A male rider would often gallantly permit his female riding companion to place her feet onto the top of the foot-warmer if she wished. The blanket would trap the heat radiating from the foot-warmer, thereby heating not only the riders' feet, but their whole legs. The type of blanket that was usually employed for use on a carriage was what was called a horse-hair blanket. It was called that whether it was constructed from horse hair or not. The horse-hair blanket tended to be a quilt that was filled with sawdust or hay, which added to it extra insulating properties. When the riders arrived to their destination, such as the church or meeting-house, the foot-warmer would be carried along for continued use. Foot-warmers were used more by women than by men, perhaps because men tended to wear heavy leather boots as compared to women who tended to wear cloth or thinner, patent leather shoes. Children also crowded around the foot-warmer to warm not only their feet and toes, but also their hands and fingers. In fact, the children often were granted the 'privilege' of loading and emptying, and carrying the foot-warmer. I titled this post: "Sometimes you don't find objects; the objects find you" because it is true. Years ago, I was visiting a local antique store, and I came across a book that I thought I would buy. It was titled: Pennsylvania In The War Of The Revolution, Battalions And Line. 1775-1783, Volume II. The subject matter of the book included histories and rosters of the regiments that made up the Pennsylvania Continental Line during the American Revolutionary War. 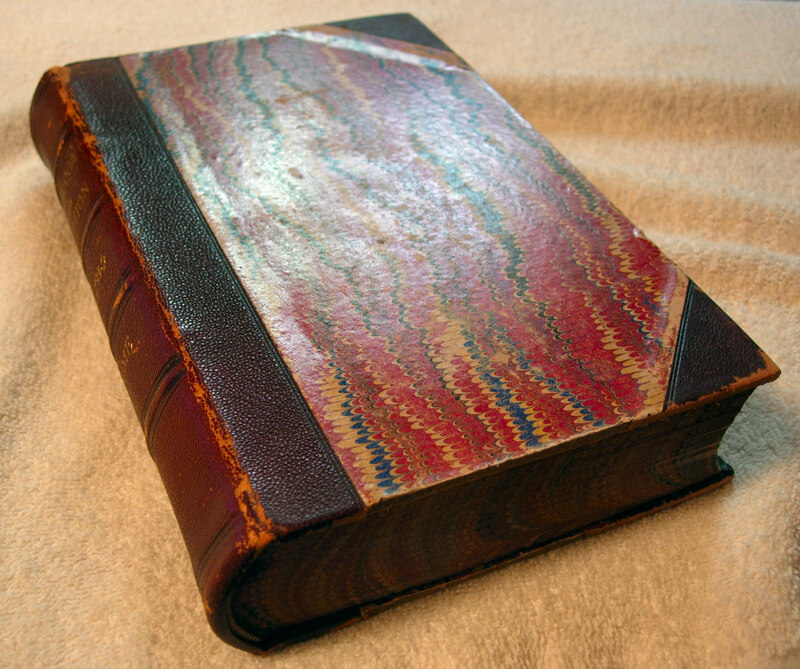 The book has what is known as "three-quarter leather binding with hand-marbled paper covers." The pieces of leather on the cover are of a reddish-brown color, and the marbled paper is predominantly red. I like books that are so nicely bound, and so the purchase of this one was not in question. The only problem I found in the book was that it included information only on the Continental Line and not the various provincial militia troops. (Of the thirteen men from whom I directly descend, who took up the Patriot Cause during that War, they all served in provincial militia units rather than the Continental Line. Therefore, the book I had found, although interesting enough, was not of much use to me personally. What was a bit aggravating was that this volume, being the second of two, contained an index in which I could see that information regarding my own Patriot ancestors had been included in Volume I. About four or five years after finding the above-mentioned book, I was visiting an antiquarian bookstore in Lancaster, Pennsylvania. Much to my surprise, I came across a box of nineteen books from the published Pennsylvania Archives. They were under a table of other books, in a part of the store that I had not really intended to visit. 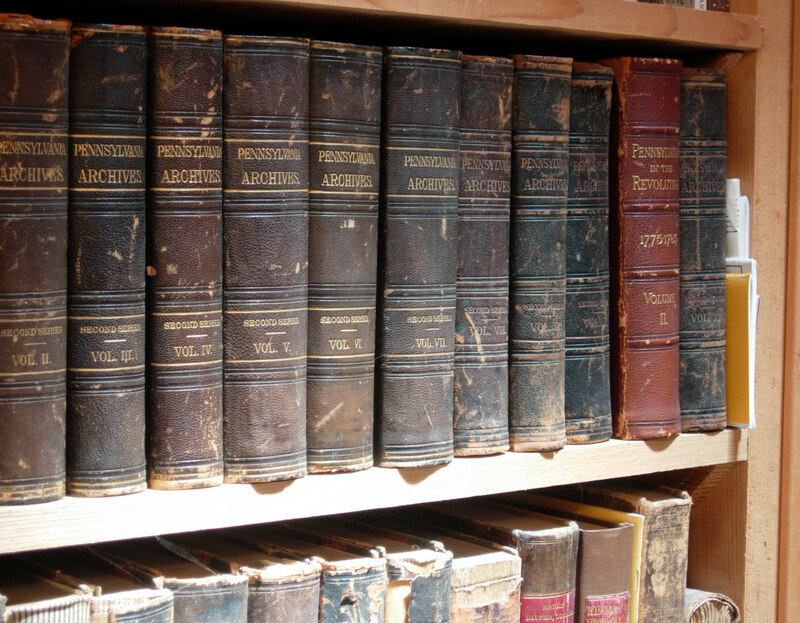 The books were from the Second Series and included nineteen volumes. At the time, I did not take the time to check if every volume was in the box; I was assured that the set was complete by the owner of the bookstore. The bookstore owner said that the whole set, which consisted of nineteen volumes, was there, and so as the price was right, I purchased the box. 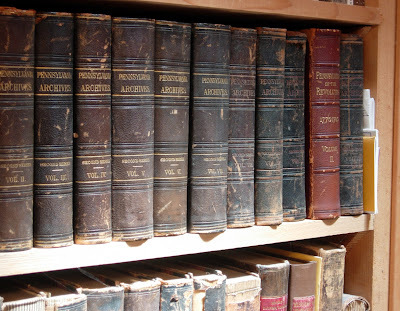 As I was looking through the books that evening, at the motel in which I was spending the night, I put them in order to make sure that every volume was accounted for. In so doing, I discovered that there were actually two copies of Volume VI (i.e. Six) and no Volume XI (i.e. Eleven). In this set, Volume X (i.e. Ten) was titled: Pennsylvania In The War Of The Revolution, Battalions And Line. 1775-1783, Volume I. The set of books that I had just purchased was complete, with the exception of missing only one volume ~ and that volume was the one that I had purchased about five years before. I was dumbstruck! I could hardly wait to get home to check if the book that had been on my shelf for five years was the one missing from this set. The nearly complete set of books that I purchased in Lancaster were also three-quarter leather bound, with hand-marbled paper covers, but while the paper marbling was the same as the other single volume ~ predominantly reddish in color ~ the leather portions were of a dark brownish-black color. The set was published in 1895, while the single volume was published in 1880. It's amazing how the set-minus-one-volume made its way to be found by me, and for the missing volume to be the one that I already had in my possession. I am not sure if it was coincidence or fate that brought all nineteen volumes together, but somehow they all found me. My mother, Dollie's surname was Nofsker. She was descended from Michael and Anna (Servin) Naffzger. The Naffzger (variously, Neffzger) family originally made their home, during the mid-1600s, near Baden, in Canton Aargau, Switzerland (to the northwest of Zurich), but later came to reside in the village of Frauenfeld in Canton Thurgau, Switzerland (to the northeast of Zurich). Michael and Anna's son, Hans Caspar Neffzger, moved his wife Elizabeth (Gysi) and their family further westward, taking up residence in the village of Bubendorf in Canton Basel. It was at Burbendorf, that Hans Caspar Jr made a living as a shoemaker. His sons, Hans Caspar III and Hans Jakob, also took up the profession of shoemaker. A third son of Hans Caspar Jr, Heinrich, moved to the city of Basel, being listed in public records as a resident in both the Horburgstrasse and Colmarerstrasse sections of the city. Heinrich's grandson, Heinrich Naftzger, emigrated from his ancestral Swiss homeland with his maternal grandparents, Heinrich and Anna (Thommen) Meyer. The Meyers and grandson, Heinrich Naftzger, arrived at Philadelphia in the colonial province of Pennsylvania in 1771. Heinrich Naftzger was my mother's great-great-grandfather. After he married Margareth Beschtler in Lancaster, Pennsylvania, they moved northwestward to take up residence in Miles Township, Centre County, Pennsylvania. And guess what occupation Heinrich took up? He became a shoemaker! When he died, his will revealed a number of shoemaker tools. One of Heinrich's sons, Jonathan, would take up the profession of shoemaker, in turn, being listed as such after he moved to the Bedford County township of Greenfield circa 1838. Now, my primary intention in this post was not to give you a full family history of my mother's ancestors, but rather to point out that sometimes a profession or occupation is handed down from one generation to another. Such was the case with my Naffzger ancestors and the occupation of shoemaking. Let's look at some names first. A shoemaker was once called a cordwainer. Cordwainers were identified in England as early as 1100. The name was gradually superseded by the name shoemaker as the need to differentiate between the shoe-maker and the shoe-seller became evident. Then there is the name cobbler. Many people think that the names cobbler and shoemaker were interchangeable. They weren't. The shoemaker, as the name suggests, made shoes. The cobbler, on the other hand, repaired shoes. 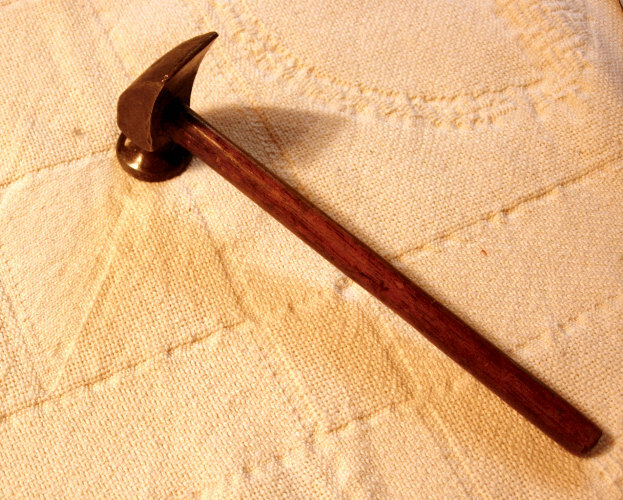 The object pictured here is known variously as a shoemaker's hammer or as a cobbler's hammer. The same hammer would have been used to make and repair shoes, so the names are interchangeable. The shoemaker worked with very small tacks when constructing shoes, in the attachment of the heels to the soles, and so a small, but heavy headed hammer was ideal for his work. 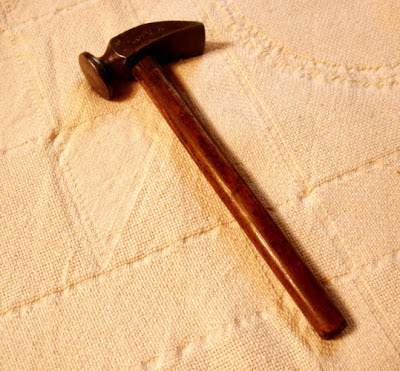 But other than that function, the hammer was not used for conventional hammering of nails in the making of shoes. 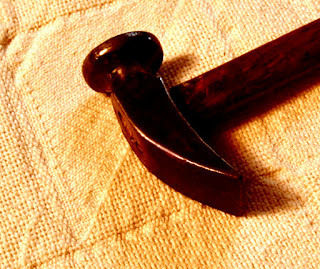 Rather, the hammer was used to stretch and form the leather over a wooden or metal last. 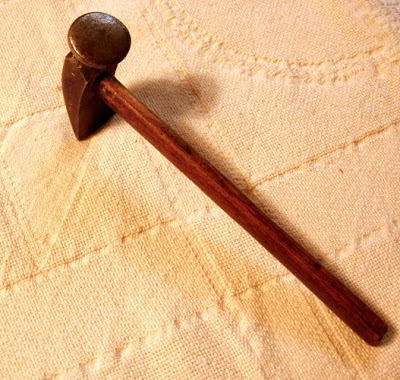 The wide, blunt end of the hammer was used to peen the leather, the word 'peen' meaning to form it into shape by striking it. The leather would often be dampened and then peened with the shoemaker's hammer; this resulted in the fibrous tissues of the leather being flattened, thereby making the leather somewhat water resistant. The leather was stretched and shaped over a wooden mold called a last. The name for this mold was derived from the Old English laeste, which itself was derived from the Old High German leist, meaning a track or footprint. The shoemaker's last, as shown in the accompanying examples, was commonly made of wood, carved in the form of the inside of the intended shoe. The shoemaker would come to possess lasts in various sizes to accommodate a variety of customers' foot sizes. But only one last per size was needed because there was no difference between the left and right shoes. Both shoes in a pair tended to be given square, flat toes; left and right were interchangeable. As the Nineteenth Century merged into the Twentieth, the wooden last came to be replaced by a metal one. Then, with the development of machines that accomplished all of the duties of the shoemaker during the Industrial Revolution, the shoemaker found himself out of a job. I acquired the wooden shoe lasts that are shown in this post at different times and at antique stores and flea markets throughout the south-central Pennsylvania region. The lasts which were used by Jonathan Nofsker, the most recent shoemaker in my mother's family, were found in a large trunk when his great-grandson was going through his deceased parents' estate. He called me up to ask if I had any idea why his parents would have a trunk full of a bunch of carved wooden 'things'. How About A Cup Of Java? Although it may sound too fantastical to be true, there was a time when Starbucks didn't exist. This post has to do with an object that was used by almost every family even long before coffee was carried by Juan Valdez on the back of his mule, Conchita. The coffee grinder was a personal means of grinding coffee beans, and just about every family owned at least one. The antique coffee grinder shown here was what was called a burr-grinding coffee mill. It employed two wheels or grinding elements between which the coffee beans passed. The grinding elements crushed the beans between them, tearing them open to release the essential oil that makes coffee taste the way it does. The coffee grinder has two thumbscrews that altered the distance between the grinding elements, therefore allowing the homeowner to change the size of the crushed pieces ~ therefore changing the amount of essential oil being released. The homeowner would pour coffee beans into the bowl shaped receptacle at the top of the grinder. Then, with one hand holding the grinder firmly on some work surface, the handle would be turned, with the other hand, in a clockwise direction until all the beans would be moved through the bottom of the bowl. The result of this action would be that the beans would be crushed into pieces and deposited into the drawer in the grinder's body. The process would be repeated until the desired quantity would be obtained. The coffee grinder shown here was constructed of wood, with its sides dovetailed together and the top and bottom pieces nailed on with small headed brads. The bowl and grinding mechanism is made of metal ~ the bowl being a soft metal such as a tin alloy. The great thing about this antique is that it retains a slight aroma alluding to its purpose. 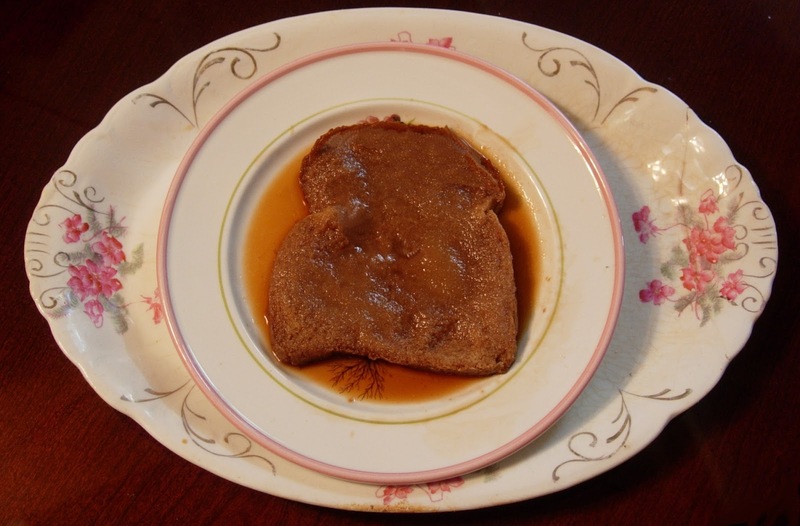 Although some coffee connoisseurs would claim that coffee has to be either percolated or steeped to be potable (i.e. drinkable), in the early days, the crushed coffee bean pieces would then be dumped into a coffee pot, water would be added, and the pot would be placed either on a ledge in the fireplace or on a stove burner to heat. The heated liquid would be poured through a strainer and into a cup, the strainer catching any floating pieces of the coffee beans. The work required to obtain a cup of coffee by grinding the beans in one of these mills probably made the end result taste delicious. When my brother, sister and I were young and we got sick, my mother would give us a dose of Liniment. According to one source, a liniment was a type of balm to rub on the skin; the name was derived from the Latin linere, which meant to annoint. As a child growing up in the 1950s and 60s, liniment was a cure-all for whatever you were sick with. If you had a cold, you took a dose of liniment. And by the term 'took a dose' means that we took it internally, rather than rubbing it on our skin. If you had the flu, you took a dose of liniment. If you had a bad stomach-ache, you took a dose of liniment. If you had arthritis, you took a dose of liniment. I don't know if liniment cured a broken arm ~ primarily because none of us ever broke our arms. I would bet, though, that if one of us had broken an arm, we would have been given a dose of liniment. There were many brands of liniment available in the United States during the first half of the Nineteenth Century. Watkin's was one brand. Porter's was another of them; it was the brand that my mother chose. Rawleigh/McNess was another brand, and one of the few that are still being marketed. Liniment was the descendant of the infamous circus sideshow snake-oil. And no matter what the brand, all liniments were basically the same. 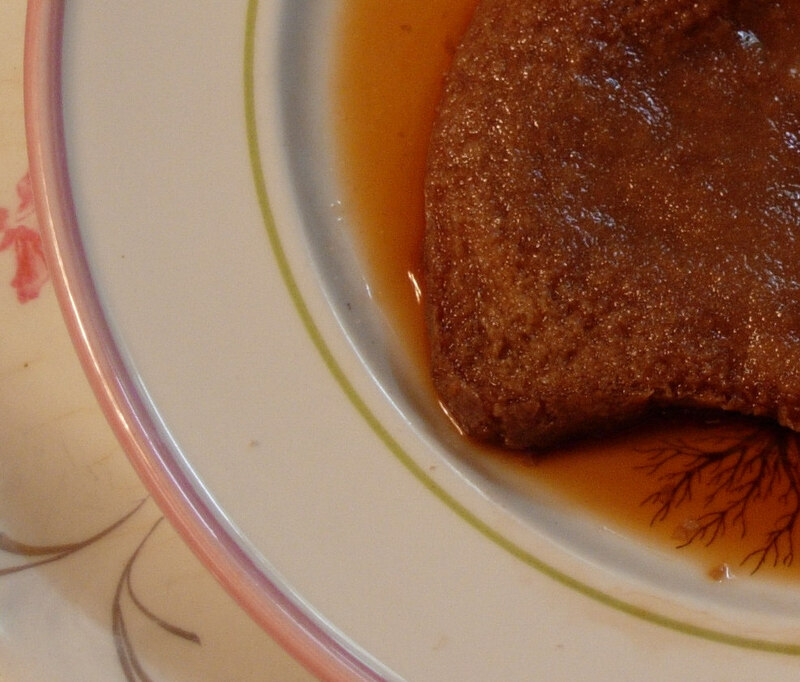 They all seemed to contain a variety of ingredients, one of which was bound to affect some ailment. Porter's Liniment contained ether, ammonia, capsicum, camphor, oil of cajeput, cloves, myrrh, galangal, and safrol. The bottle's label notes that the contents were 63% alcohol. As ingredients on any product have historically been listed in order by largest percentage first and proceeding to the least percentage, this would indicate that ether comprised the most of what made Porter's Liniment work, and accounted for the alcohol content. Of the remaining ingredients, the capsicum - the thing that makes pepper hot - would help to cause a fever to break. The camphor, which was employed primarily in external medicines, was readily absorbed through the skin; when taken internally, camphor was a remedy for fatigue. It has been found to alleviate minor heart problems. The oil of cajeput was a pungent oil that came from the leaves of the melaleuca tree; the oil was used externally to reduce inflammation and internally to induce vomiting. The cloves were included to function as a carminative to prevent the formation of, and/or to promote the expulsion of gas. 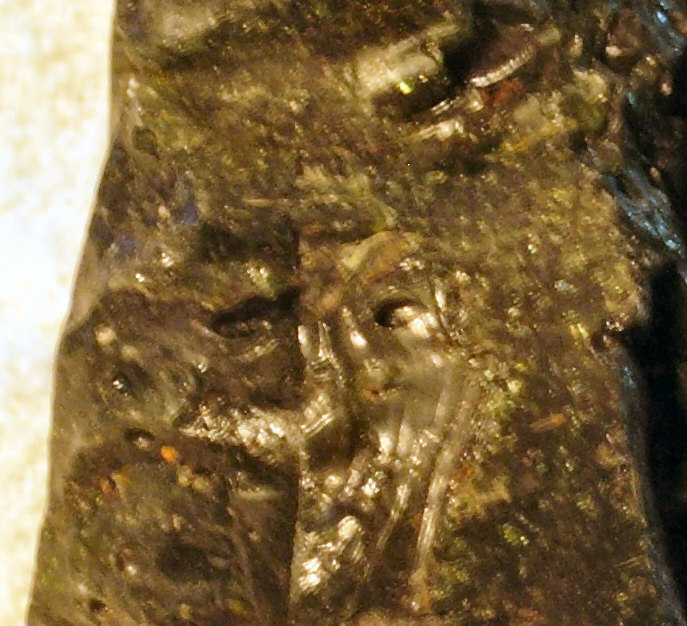 Myrrh was sometimes ingested to 'cure' rheumatism and arthritis, and was believed to relieve circulatory problems. Galangal was a plant related to ginger, and would have been included to function much like ginger as a stimulant and reliever of constipation. The last couple of ingredients would actually have very doubtful benefits, if any, for human beings. Ammonia has no beneficial qualities, and safrol has been found to be a carcinogen. From this list of ingredients it can be seen that a wide variety of ailments might be relieved by the liniment (while threatening to cause a few ailments if abused. 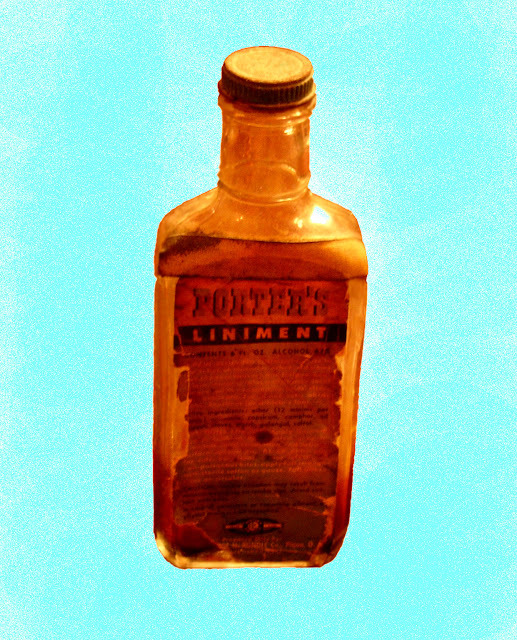 Although the Porter's Liniment bottle did not specifically warn against being taken internally, the list of uses are all related to external ones: sore muscles, cuts, insect bites and so forth. But, as I noted above, my mother gave us doses of the liniment orally. She would mix about 1/4 teaspoon of liniment with one or two teaspoons of sugar and enough warm water to fill a small glass. We would be instructed to drink the mixture down at once ~ no sipping. If you had a sore throat, look out! The liniment would burn the whole way down. But you can believe that after you took the dose of liniment you wouldn't be sick very much longer. The original purpose of this blog was to present objects related to the Colonial and American Revolutionary War periods, and explain their use and history. For the most part, I've tried to adhere to those original intentions. But, from time to time, I have deviated from the original time periods and written posts about objects of more recent age. This is going to be one of those again. 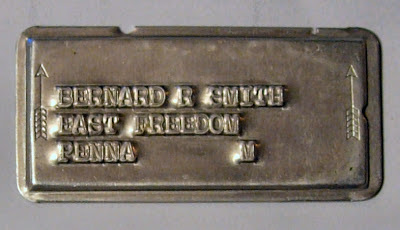 Exhibited above is an object that belonged to my father, Bernard R. Smith. 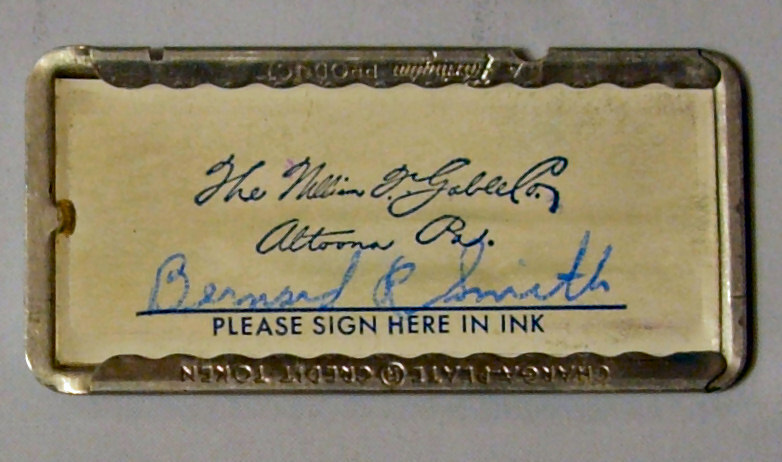 It consists of a piece of metal, measuring 1-1/8" by 2-3/8" The piece of metal encloses, on one side, a piece of paper stamped with the name and location: The William F. Gable Co., Altoona, PA. Below that was a line on which my father signed his name. The backside of the object reveals that my dad's name and address were emboss-stamped into the metal. Two arrows point in the direction above my father's name. So what could this thing have been used for? Engraved on the edge of the small metal plate, on the side with the paper signed by my father, are the words: Charga Plate Credit Token. That should reveal the purpose of this object. As early as the Renaissance in Europe, forms of credit were being extended by artisans and merchants to customers. It was probably discovered that it was more beneficial to the merchant to sell their goods by credit rather than being passed up by customers who could not make the purchase at the time. As the American Colonies emerged and progressed on the North American continent, and on into the Nineteenth Century, merchants continued the practice of extending credit to their customers. Surviving to the present day are journals in which local merchants would record, by hand, their customers' credit transaction records. A common phrase heard by merchants was "please put it on my account." And so they would open the journal to the customer's record and tally the purchase. 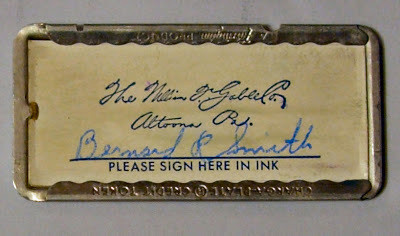 In the 1950s and 1960s, in America, and perhaps in other parts of the world, companies such as the 'department' store, The William F. Gable Company located in Altoona, PA, started moving from a handwritten journal to mechanically processed records. Unlike today's credit cards, there was no magnetic strip to trigger the 'impression' of the customer's name and address, and that little printing press machine eventually was transformed into an electronic reader with a slot through which the card is passed. And not only is that a benefit of convenience: no longer is there any carbon paper to smudge and smear onto the clerk's fingers. Everyone knows that teigbehalter is the German name for dough tray. But if you didn't know that, don't worry, most people who don't speak German didn't know it either. Anyways, as you might have guessed, this post is going to be about the dough tray, variously: doughtrey. It was a piece of furniture for the kitchen, which was essentially a cupboard. A housewife would prepare her bread and/or pie dough on a table, and then she would lift the lid of the dough tray and place the dough inside it to rise. The dough tray provided for the dry, cool spot that dough required to rise properly. The dough tray pictured here dates from the 1860s to the 1920s. As you can see in the two photos below, the lid is not attached to the dough tray itself, but just sits on it and then is llifted off for access. The dough tray, a large bowl-shaped form covered by a lid, developed from the dough bowl, which was simply a wooden bowl into which the dough would be placed, and then be covered by a piece of cloth, such as a dish towel. 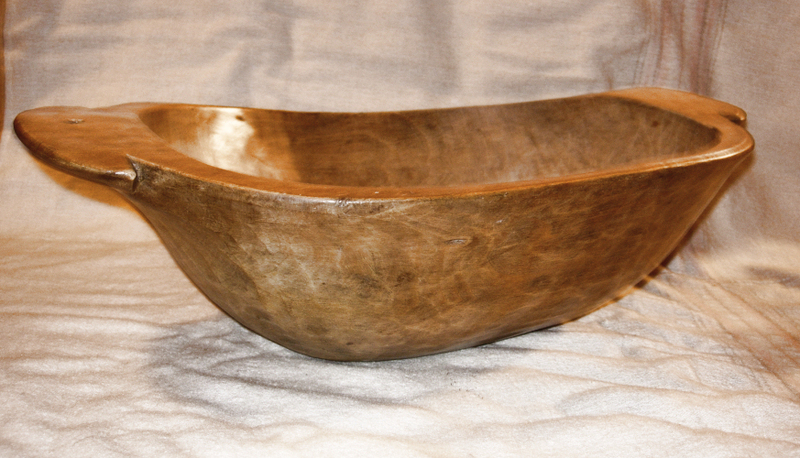 The accompanying photo shows a wooden bowl sometimes used to hold dough when it was prepared for rising. I have a thing that lies on my bookshelf collecting dust. That thing is a hunk of glass. And so, you might ask, why would anyone have a hunk of glass lying on his bookshelf? 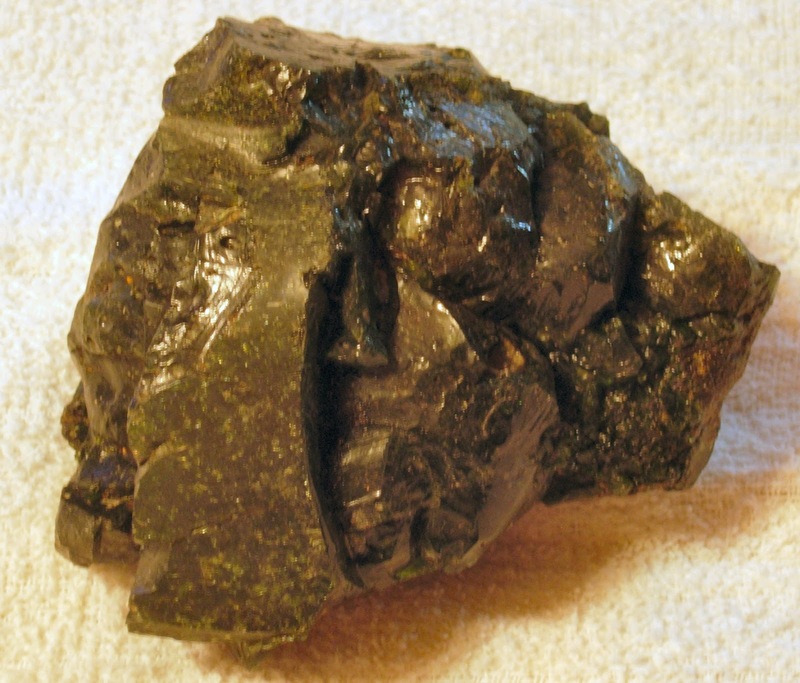 The hunk of glass started out as a hunk of iron ore stuck in some rocks along with a bunch of other stuff. At some time in the 1830s or 40s, that hunk of iron ore (stuck in some rocks along with a bunch of other stuff), was wrenched from its home, probably by a Irish immigrant using a pickax, and dumped, like so many other hunks of iron ore, into the open top of a furnace. You see, the hunk of glass is actually the refuse of the ironmaking industry that thrived in this south-central region of Pennsylvania in the 1800s. Starting in the year 1828, Peter Shoenberger, a wealthy ironmaster from Pittsburgh, began to build a series of iron furnaces and forges throughout this region. He named them after his daughters, including: Sarah, Martha, Maria and Rebecca. Shoenberger also bought up large tracts of land in the region in order to obtain the iron ore, limestone and wood that would be needed to operate the furnaces. The ironmaking process was not really all that complicated. Iron ore would be dug out of the ground, and then dumped into the open top of the iron furnace by workers (mostly Irish immigrants fleeing from their homeland because of the potato famines) using wheelbarrows, or by carts drawn by mules. The purpose of filling the furnace with the iron ore would be to heat it until the metal melted out of the rock to which it was attached. Wood was cut into standard lengths and then stacked in the form of a truncated cone by a collier, a man who burned the stack slowly in order for it to turn into charcoal, which would then be used to fire the furnace. Limestone was quarried out of the ground and then heated in its own small furnace before being stacked in piles in an open field, where it would be rained upon and allowed to slake, or crumble, into limestone dust. 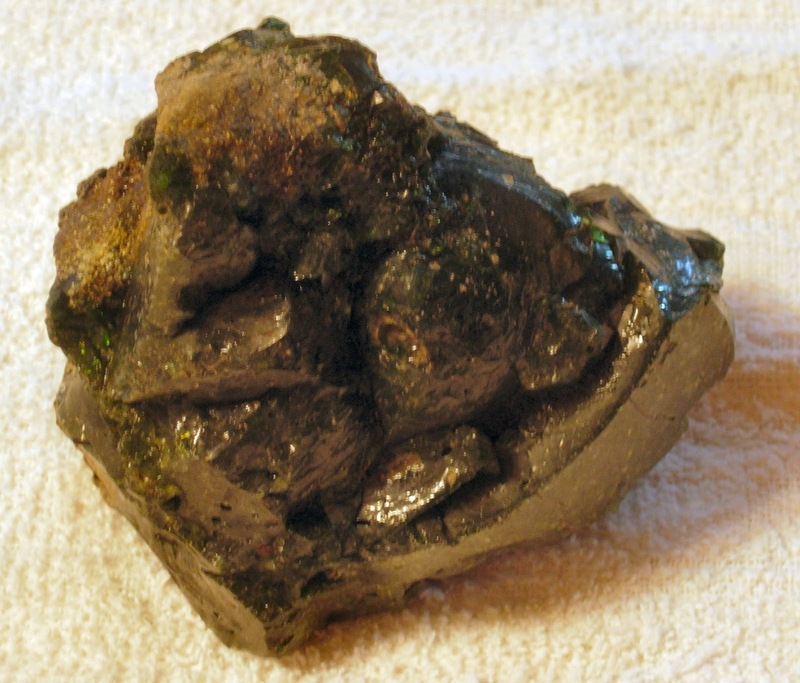 Then it would be dumped into the furnace to help cause the various 'impurities' to separate from the iron as it melted. The furnace would be located alongside a river so that the energy of the moving water could be harnessed to turn machinery gears that operated large bellows to pump air into the furnace when necessary. As the iron ore melted and separated from the impurities in the rock, small access holes near the bottom of the furnace would be unplugged and knocked open. This allowed the molten iron metal to flow out of the furnace and into a main trench and numerous offshoots dug into the ground. As the outside air hit the hot metal emerging from the furnace, the furnace was said to "blast" with an explosion of sound that could be heard for up to ten miles around. (Many people called the iron furnace a blast furnace for that reason.) The molten iron, leaving the furnace and pouring into the trenches and their offshoots, formed what was called the sow and pigs ~ hence the name pigiron for the initial product drawn from the furnace. After the pigiron was pounded, heated and pounded again many times in an adjacent iron forge, it was given the name of wrought iron. So we now come to the thing that lies on my bookshelf collecting dust. It is a piece of glass, like I previously stated, but it is not glass that was intended to be glass. 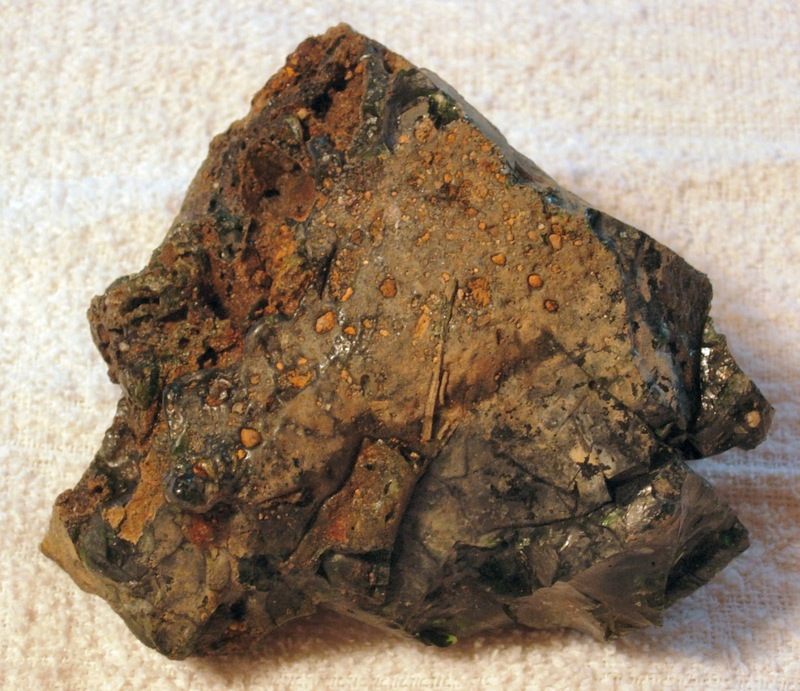 Instead, it is a piece of glass that formed in the iron furnace (the Sarah Furnace near the town of Claysburg to be exact) when the limestone dust caused sand and other impurities to separate from the iron. 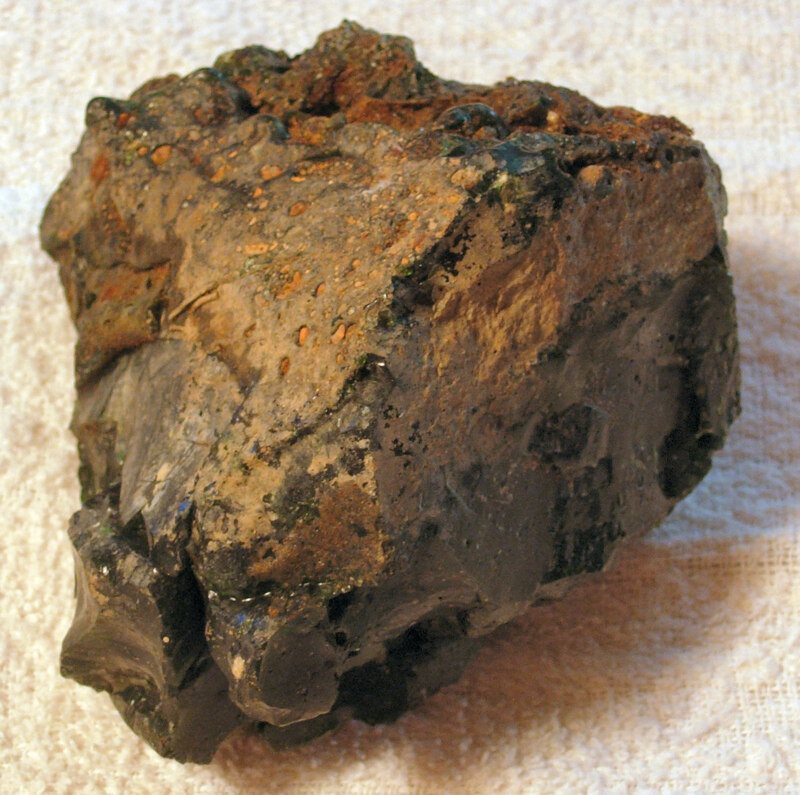 Commonly called slag, the stuff that comprised the impurities would sometimes fuse together into, among other refuse, glass. After the molten iron would be completely drained from the furnace, the remaining mass of impurities would be raked out of the furnace, and transported to a dump heap by those same Irish workers using either wheelbarrows or mule-drawn carts. The thing that lies on my bookshelf collecting dust lay on that dump heap for 150 years before being retrieved by a friend of mine while out for a walk, who in turn gave it to me (when I saw it on her desk at work, and exclaimed "Wow! That's a beautiful piece of slag!"). What might not be seen in the photos of this piece of slag is the intensely beautiful green color. 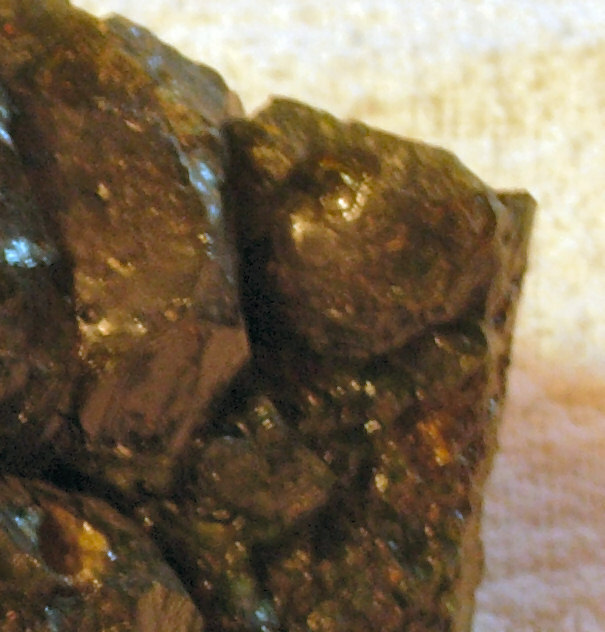 And what can't be experienced by this blog's readers is the razor sharp edges ~ it is real glass!